Pehr Kalm (1716-1779), a Swedish-Finnish explorer and botanist, was a student of the great naturalist Carl Linnaeus. In fact, Kalm was one of the many “apostles” of Linnaeus sent out to explore the world, and one of the few who didn’t die in the process. To begin the research that later culminated in Travels into North America, Kalm arrived on the continent in 1748. Based in Philadelphia, he worked and traveled with Benjamin Franklin and John Bartram, among others. In his explorations of Pennsylvania and New Jersey and two journeys north through New York to Montreal and Quebec, Kalm formed impressive specimen collections, which Linnaeus subsequently used in naming 90 species of plants, 60 of them new to science, in his Species plantarum (1753). Among those new species, Linnaeus named the mountain laurel genus Kalmia for his disciple. Swahili Coast: Exploration by French Captain Charles Guillain, 1846-1848. Part 1, Re-building an Empire and Emancipating Slaves. 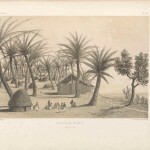 The blog post, first of three, was written by Xavier Courouble, research assistant for Sailors and Daughters: Early Photography and the Indian Ocean, an online exhibition part of the Smithsonian’s National Museum of African Art’s Connecting the Gems of the Indian Ocean: From Oman to East Africa. Recovering from loss of empire following Napoleon’s defeat at Waterloo in 1815, the French sought to re-establish commerce and colonies in the Indian Ocean. The task fell to Charles Guillain, who led a French expedition to the Swahili coast of Eastern Africa in 1846-1848. Our record of his travels is enshrined in a magisterial 3-volume work Documents sur l’histoire, la géographie, et le commerce de l’Afrique orientale and the accompanying atlas folio of engravings and maps, Voyage à la côte orientale d’Afrique. The Smithsonian Libraries has digitized the complete work of the volumes held by the Warren M. Robbins Library at the National Museum of African Art. Continue ReadingSwahili Coast: Exploration by French Captain Charles Guillain, 1846-1848. Part 1, Re-building an Empire and Emancipating Slaves.